Andre Rieu stands tall. He is good looking. He reminds me of the original Waltz King. 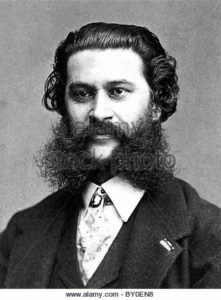 With great panache, he leads The Johann Strauss Orchestra. He faces the audience as he conducts his orchestra, violin tucked under his chin. Rieu was born in Maastricht, Netherlands in 1949. His father was the conductor of the Maastricht Symphony Orchestra. He began playing the violin at age five. Rieu has assembled a private orchestra of about one hundred performers who play light classical and popular music as well as folk tunes and anything else that can lend itself to singing or dancing…but especially waltzing. Mr. Rieu once explained to an interviewer that classical music did not have to be solemn and ceremonial with people only looking at the conductor’s back while unable to move from their seats. So, he encourages everyone to participate, sing along, clap, sway and jump up to dance in the aisles, in the front and just about anywhere where space can be found. He is renowned for his version of the “Blue Danube Waltz” and as soon as they hear the opening strains, people start to sway and applaud. He begins slowly, languorously, teasing the audience by stopping altogether then picking up the tempo and giving it his all. The orchestra members are good-looking, superbly dressed and seem to greatly enjoy themselves. This has a contagious effect. Even the audience looks like it has been hand-picked for attractive people. The Johann Strauss Orchestra tours extensively; they have their own bus and a caravan of vehicles to transport their equipment. They mostly perform out-of-doors. Everywhere they go they prepare by building elaborate sets, replicating village squares, churches, castles, and plazas. They have no sponsors and rely on ticket sales to finance all their undertakings. In his New York City appearance, Rieu teamed up with a local Gospel Group and they sang lustily together. The Orchestra also performs a lavish New Year’s Day concert in Vienna. Andre Rieu loves what he does and exudes joie de vivre and exuberance (traits not usually associated with the Dutch). In his private life he is just as flamboyant as on stage. He owns a 15th Century castle, plays a 1667 Stradivarius, and drives a red Tesla. Here is Rieu’s famous version of the Blue Danube. It has been viewed over 31 milllion times. Simone loves to hear from her readers. Please take a moment to write a comment. oh my goodness! I didn’t realize classical music could be so *FUN! * I’m dancing in my chair. Thanks for sharing, this is a wonderful thing.